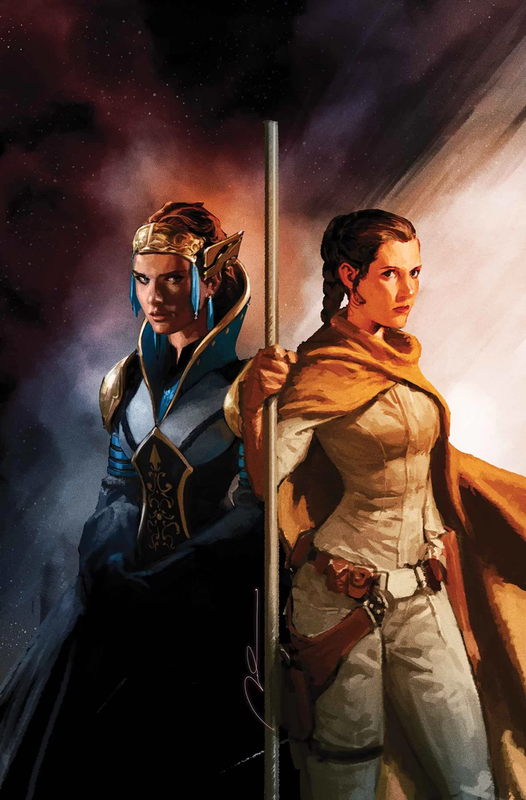 Leia gather’s her team in Star Wars #62 as they prepare to attack Shu-Torun. They bring in the shape shifter, Saw’s partisans, and the mechanic that keeps working on the Falcon. Each has shown up before in Gillen’s run on the Star Wars series, and now it’s showtime as they exact Leia’s revenge. They she’s very stubborn in insisting that this isn’t revenge. The issue opens with Leia explaining her plan to everyone. From there, they head out to gain the extra people they need. They find Tunga out doing a play about the Rebellion and in trouble with the Empire. This also gives the artists an opportunity to play homage to some early designs of the characters. Then they head to Jedha to pick up Benthic and the partisans. While there, Luke looks for the members of the death cult, but there nowhere to be found. However, they do plant a story seed that gets picked up at the end of the comic. With the team almost fully assembled, they just need a slicer, which is where the mechanic, Meorti, comes in. The issue ends with Shu-Torun and the arrival of the Central Isopter death cult. It’s nice laugh to end the issue on. The artwork for this issue is pretty good. Leia’s face looks a little odd in one or two panels, but otherwise looks great. Sometimes I get the feeling that they drawing the girl from Strangers Things as Leia rather than Carrie Fisher, but it works. Han also looks funny sometimes, but all the non-human characters, or new original characters, look great. The flow of the story, the action, and the backgrounds all work well. With a good story and good artwork, Star Wars #62 is enjoyable and sets the stage for what’s to come. While it is just a link in the chain as we get to the end, it takes the time to include some fun moments and to make the build up worthwhile. I give it a four out of five metal bikinis.